Regardless of your age or level of dental health, you are welcome at Northern Dental Design. If you’ve suffered for years from dental anxiety, it’s our desire to put you at ease and provide comfortable dental care. We’ll ensure that you will feel relaxed through your entire appointment. This type of sedation, which is also known as nitrous oxide, is administered through a mask and provides a feeling of warm relaxation. It’s appropriate for children and adults and can be increased or decreased in amount as needed. Happy gas works quickly and can be turned off immediately as soon as it’s not needed. The gas will leave your body just 3-5 minutes later. The side effects of inhalation sedation are minimal, though some people may feel nauseous after breathing it in. If you have a feeling of claustrophobia when wearing the mask, it may not be appropriate for you. 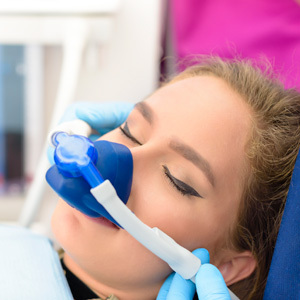 Another benefit of nitrous oxide is you can drive yourself to and from your appointment, and get back to your normal daily activities straightaway. If you need help to overcome feelings of nervousness or anxiety at the dentist, please get in touch with us today. Our caring team can answer any questions you have to make your next dental appointment stress-free.